Slapped cheek syndrome (fifth disease) is common in children and should clear up on its own within 3 weeks. It's rarer in adults but can be more serious. The cheek rash normally fades within 2 weeks. The body rash also fades within 2 weeks but sometimes comes and goes for up to a month – especially if you're exercising, hot, anxious or stressed. Adults might also have joint pain and stiffness. This can continue for many weeks, even after the other symptoms have gone. 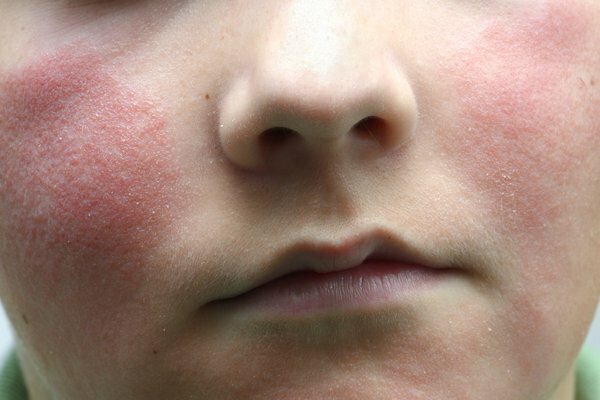 Look at other rashes in babies and children. You can also use our visual guide to baby rashes, at the bottom of this page. You don't usually need to see a GP for slapped cheek syndrome. There are some things you can do to ease symptoms while it clears up. Tell your midwife or GP if you're pregnant or have a weakened immune system and have been near someone with slapped cheek syndrome. These can be signs of severe anaemia and you might be sent to hospital for a blood transfusion. It's hard to avoid spreading slapped cheek syndrome because most people don't know they have it until they get the rash. You can only it spread to other people before the rash appears. Slapped cheek syndrome is caused by a virus (parvovirus B19). The virus spreads to other people, surfaces or objects by coughing or sneezing near them. You don't have to stay off work or school after the rash appears. Let the school or teacher know if your child has slapped cheek syndrome.